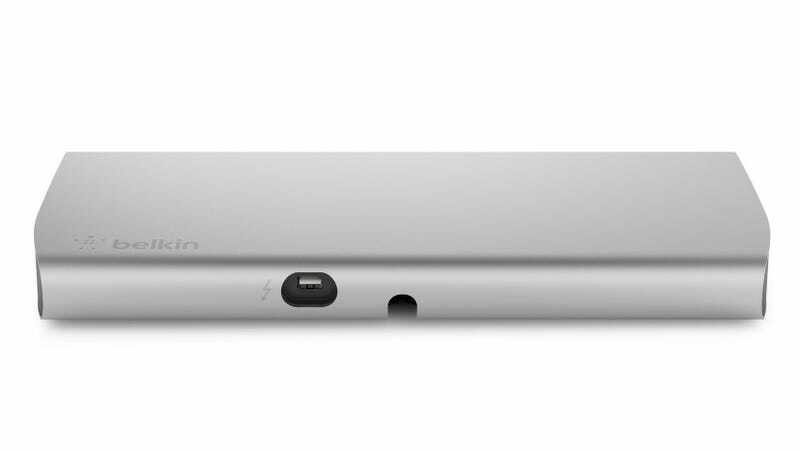 Belkin has been developing a Thunderbolt dock for almost a year. When it showed it off at CES in January, it looked like it was almost ready to go on sale... but, no. Instead Belkin has completely redesigned it and made it $100 more expensive. Oh, and you still can't buy it yet. The new version is a completely different shape to previous iterations. It packs a pair of Thunderbolt ports (one for connecting to your laptop, another for daisy chaining extra devices), three USB 3.0 ports, a FireWire 800 port, Gigabit Ethernet, eSATA, a Mini DisplayPort to HDMI adapter, and audio in and out. Compared to the previous version, it gains USB 3.0 over 2.0, has an audio-in port, and for some reason has lost a dedicated HDMI port.